Raumfahrt+Astronomie-Blog von CENAP - Blog: Astronomie - Comet Heinze (C/2017 T1): A Binocular Comet for the New Year? Ah, 2017. A year busy with binocular-bright comets has been on the quiet side lately. But the recent discovery of Comet Heinze (C/2017 T1)by the University of Hawaiʻi's Ari Heinzegives comet watchers hope for a bright and fuzzy start to the new year. Heinze searches for near-Earth asteroids with the Asteroid Terrestrial-impact Last Alert System(ATLAS) project, and came across the comet in images taken on October 2nd. The survey uses two telescopes, one at Mauna Loa Observatory on Hawaiʻi Island, and a second on the summit of Haleakala on Maui, about 100 miles to the northwest. Among other benefits, two widely-spaced "eyes" allow for distance determination using parallax, which also helps in calculating a new object's orbit. When first spotted on October 2nd, Comet Heinze was an 18th-magnitude crumb in Hydra with a 7″-wide coma and 10″-long tail pointing southwest. A preliminary orbit seemed to indicate that the object was an Aten-type, near-Earth asteroid spouting dust, an unprecedented discovery! 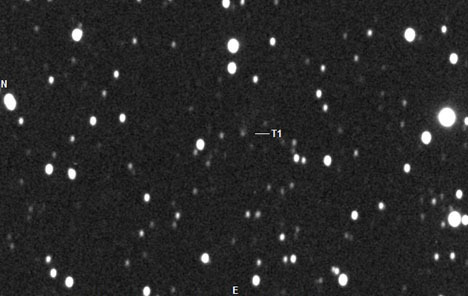 To find out the truth, Heinze manually examined another set of images taken on September 28th that the computer had missed because of light from a nearby star. With the additional positions, he nailed down a better orbit and confirmed the object as a comet. Perihelion occurs next February 21st at a distance of 87 million km, but prior to that, on January 4th, the comet will pass just 33 million km from Earth. Despite its intrinsic faintness, it's predicted to peak at magnitude 8.8 (JPL Horizons and Seichi Yoshida), putting it within range of small scopes and 50-mm or larger binoculars. Comet Heinze (C/2017 T1) begins slowly, but rapidly accelerates across the sky come mid-December. The comet should be a good target for small scopes from then through late February. We'll provide more detailed maps next month, when the comet brightens. Stars here are plotted to magnitude 6. Heinze's proximity to the planet and steep orbital inclination of 97° makes the comet a well-placed, fast-moving object for northern hemisphere skywatchers prior to perihelion. Post-perihelion, Heinze makes a mad dash south, when it becomes accessible to southern hemisphere viewers only. Coming and going, we'll all get a shot at seeing this comet. During November and early December, Heinze is a morning object, slowly moving north through the head of Hydra. Come mid-December, it crosses into Cancer and cracks the 12th-magnitude barrier, then picks up speed and rapidly brightens, vaulting from Cancer to Cassiopeia by January 6th. When closest, the comet will be traveling about 7° a day, or ~17′ per hour, fast enough to see movement in real time. During the first half of January, it will be circumpolar from mid-northern latitudes and visible all night. 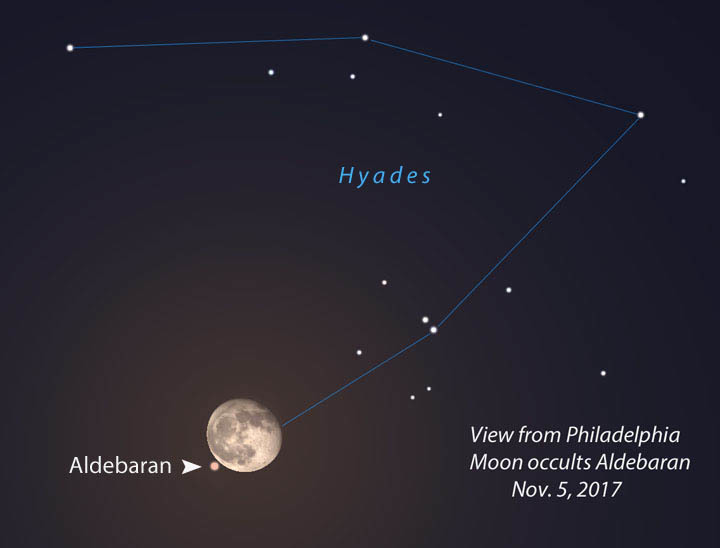 This view shows the waning gibbous Moon at 7:55 p.m. Eastern Standard Time from Philadelphia on November 5th, five minutes before it occults Aldebaran. Click the links in the text below for occultation details for many cities. On another note, the series of Moon-Aldebaran occultations that began in 2015 will soon be wrapping up, at least for U.S. observers. Two remain in 2017: The first occurs during early evening hours on November 5th(Sunday night) for the eastern 2/3 of North America; and the last on December 30th, again during evening hours for the eastern United States. The next series won't begin until 2033,16 years from now! We're entering a particularly dry period for bright star occultations. After the final Aldebaran occultation on September 3, 2018 (visible in Greenland and the Arctic), no first-magnitude star will be occulted by the Moon until August 25, 2023, until Antares steps into those shoes. Catch 'em while you can!